The Honorable Prime Minister on 15 July 2013 assigned to Engineer Khurram Dastgir Khan, currently the Minister for Commerce, the additional responsibility of the Parliamentary Business of the Ministry of Foreign Affairs. He has since responded regularly on behalf of Foreign Affairs to questions and motions in both houses of Parliament. At the Ministry of Commerce, Khurram Dastgir Khan has revitalized Pakistan’s trade diplomacy. He spearheaded the successful campaign to obtain GSP+ trade preferences for Pakistan from the European Union. In spring 2014, he led vital negotiations to obtain reciprocal market access for Pakistan and to normalize trade with India. His vigorous diplomacy has led to start of Pakistan’s negotiations for free trade agreements with Turkey and Thailand. Under his stewardship, the Ministry of Commerce has revamped national trade defence laws, obtained approval for Pakistan’s accession to TIR convention, and has successfully concluded institutional reforms of the Ministry itself as well as its attached departments. He has steered the drive for a qualitative shift towards value-addition and diversification in Pakistan’s exports. Khurram Dastgir Khan was trained as an engineer at California Institute of Technology and also holds a degree in Economics from Bowdoin College, both in the United States. He is a Life Member of Pakistan Engineering Council. Khurram Dastgir Khan was elected from his native city of Gujranwala to the National Assembly of Pakistan in 2008 and re-elected in 2013. During the 2008-13 Parliament, he earned distinction as Chair of the Standing Committee on Commerce and as a member of the Public Accounts Committee. As a dynamic Parliamentarian, he also served on the Special Parliamentary Committee on Kashmir, Finance Committee of the National Assembly, Special Committee on Threats to Journalists, and the Standing Committee on National Regulation & Services as well the Standing Committee on Millennium Development Goals. 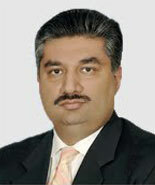 Affiliated with Pakistan Muslim League-N [PMLN], Khurram Dastgir Khan has served as national office-bearer in leadership positions within his party. He was serving as Special Assistant to Prime Minister at the time of the military coup d’etat in October 1999. During 1999-2008, he led resistance to authoritarian rule in his native district and participated actively in PMLN’s national resistance.